The Bosu Balance Trainer is a perfect training tool to improve all aspects of balance in your life. It can be a great balance training tool for the healing of your body-mind-soul. For my complete list of Bosu Ball exercises, scroll to the bottom of this page. 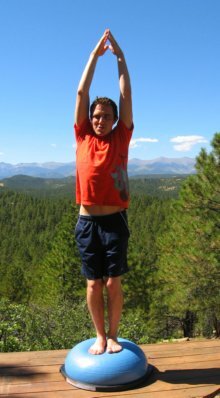 This article is a continuation of my ideas in my article, "Body Balance." If you read this article first, you may have a deeper understanding of what is to follow. Balance training is another way to use your body as a window to your soul. Remember, from my body balance article that it takes the right brain to access the body’s sensations and it’s special perceptions. This is why you need to access your body through your right brain to re-discover your true inner self, in order to heal your body-mind-soul. You need to learn to turn off the left, rational, detail-oriented brain, and go inward to discover body-mind balance. I hope to show you in this series on the Bosu Balance Trainer, the value of balance in all things in your life: physiologic or body balance, mental balance and life balance. I hope to show you that by doing body balance training exercises that this will improve your life balance and your body-mind balance. I want you to be able to state with conviction, first as an affirmation, then as a reality, "I am balanced in all things in my body-mind-soul!" Balance is extremely important in your health. Your body always performs best when all your muscles are uniform in size and strength and are uniformly balanced. If your muscles are uniform and balanced, you will have less pain in your knees, back and all types of chronic pain. Bodily pain is the result of unbalanced muscles that are being overused by one side of your body. By training your physiological balance, you will understand that "Balance is the foundation on which all other performance components are built. Balance, is in fact, the foundation of all movement. It is elemental and basic, yet so profound. Achieving better physiological balance can act as the catalyst toward transforming your sense of balance into a state of mind as well." These are the words of the inventor of the Bosu ~ David Weck. He clearly understands the direct relationship of body-mind balance. He is the reason why I chose the Bosu Balance Trainer to present my philosophy of body balance and its affect on your mental and life balance. Just like your body, your mind performs best when it is open, flexible and balanced. Balance and flexibility are important in all your physical activities that you do. As you age, balance and flexibility become more and more important and if you work on them they will greatly enhance the quality of your life! I believe that balance and flexibility are actually more important than aerobic exercise or 'cardio.' I believe that way too much emphasis is placed on the calorie burning effects of cardio, and not enough attention is placed on physiologic damage that pounding the pavement and the machines may bring. At first we were told in the 70's that for cardiovascular health we should do aerobic training for 20 minutes, three times a week getting our heart rates up. That was feasible and we all jumped on that bandwagon. Then, as we ate more and more, and sat in front of computers for more hours of the day, the aerobic exercise was more about burning calories to counteract this new lifestyle. Recently, the recommendation became 30-60 minutes of moderate exercise most days. Those of you who could keep up with constant aerobics burnt yourself and your body out. Those of you who couldn't became more sedentary and overweight. If you didn't become one who had exercise bulimia, it became almost impossible to keep up with it all, didn't it? Ah, but I digress. If you use a Bosu Balance Trainer, hopefully you can combine some fun with your cardio. When you do cardio on the Bosu ball, you also work on your balance. Aerobic exercise is achieved by jumping on it, and jumping off it. In addition to putting fun back into your workouts, you can combine the best features of most exercise machines. Balance training on the Bosu Balance Trainer will also strengthen your muscles, especially your core and improve your flexibility as well. It is great for core exercises and strength training exercises. You can kill many birds with one stone and cut down on your training time. I love my Bosu Balance Ball. There are now many brands in addition to the Bosu name, some for less than half the price. Click on the link to see your many choices if you are interested in purchasing one. All in all, any type of balance trainer is not much money when you take a look at how much it can do for you and your body-mind-soul health. It has been so much fun for me to learn and create some of my own unique balance exercises on the Bosu Ball. One early September day, my stepson and his friends came to our place. I brought out the Bosu Balance Trainer and they immediately became like school children, playing on the Bosu ball, challenging themselves, and began a friendly competition with one another! As some of you already know, I love any bouncing and jumping movements. There is something kinesthetically innate in all of us with repeated jumping/bouncing movements. It is like a vibration therapy for your body. Therapists use this movement on physically and mentally handicapped children. The bouncing and jumping movements are rhythmic (even if you don’t feel you have much rhythm) and allow you to go inward to make your movements more meditative. You can use the Bosu Balance Trainer, either side up or "BOth Sides Up" for various exercises. You can even use it like a wobble board, which you will see in the links below. Like all body-mind-soul exercises, if you take it slow and meditate your way to fitness, your body-mind balance will improve dramatically. As in all my videos I will only give you meditative music, to enhance your journey inward. This will force you to use your right, feeling brain, instead of your left, detail oriented brain. Once you view the movements and get into a meditative frame of mind, you can apply them to your own practice. Your body, mind and soul will love you for it! Are you like me, getting really tired of viewing YouTube videos and exercise DVD’s where the 'fitness expert' takes 75% of the video time going over EVERY detail of the move(s)? They tell you exactly where to put your feet and the exact alignment of your body, and on and on ad nauseum. If you learn to listen to the information from your body, and learn to develop intuition on your own, you will remain safe on your Bosu ball. It is all about not ignoring any pain or discomfort! Isn't amazing that each and every one of us learned to walk on our own? You didn't need a personal coach to learn to walk, did you? Even if someone tried to tell you how to balance, or move your legs, your brain wasn't able to understand! Your left brain wasn't developed enough, was it? Your intuition was the primary force, so that the left brain couldn't get in the way! We need to restore our ability to learn things on our own and trust that we know best about what our body's messages are telling us! This is why I love to do everything, as much as possible in my bare feet. More sensory input to guide me. More "energy" that I can perceive, regarding how I am doing and how my body is responding! All physical movements have a dynamic component. Our bodies are NOT static and isolated in and of themselves. All movements of the body-mind-soul are intuitive, ultra personal, effortless and non-ego-based. In order to know if you are moving intuitively, and that it is of the body-mind-soul, follow this rule of thumb: If the movement hurts, don't do it! All intuitive movement should bring your heart Peace and Healing! In other words, stop what you are doing if it brings you pain, and seek alternatives. I know, I know, I am telling you what to do in the following points. These were meant only to be encouraging and general guidelines for you. Just skip this section if you need to! If the Bosu Balance Trainer is new to you, go slow at first. Start out with 5 minutes on your balance trainer and gradually work up by 5 minutes or so per day. You will be required to use muscles of stability and balance that you didn’t know you had! Even young newbies on the Bosu ball will feel sore after too intense a first work out. If you are over 40, have a chronic health condition or are new to any type of body-mind-soul exercises, you should seek guidance of your health care provider. If a movement hurts, just don’t do it! If it brings you healing of your body-mind-soul, just do it! 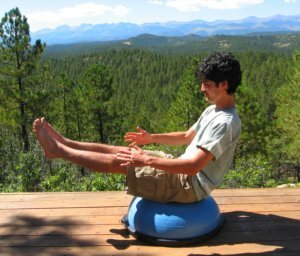 If you wish to make your movement an intuitive movement, or more meditative, don’t worry about how you do it. Just move and get lost in the music, or just get lost inside your movements themselves. I prefer to do all balance training exercises on the Bosu Balance Trainer in my bare feet. You may prefer training shoes. Do whatever feels the best for you. You may have a better kinesthetic experience with bare feet, I don’t know for sure – it is just MY intuition! Don’t worry if you lose your balance and fall off the Bosu ball. Just get back on it and keep trying. Every day you work on it, your balance will improve. The Bosu is safe for all skill levels. As you go inward for the balance training exercises, focus on finding your "center." This is otherwise known as your core, or as I like to call it, the "core of my being." This is what the Yogi’s refer to as the Chakra energy channel that runs along the spine. Your center is where all your body’s energy is created, stored and released. Your center is your Power. That is why body-mind balance is SO important. When you find your center, you find your Power. The Bosu ball can help you enormously! In order to find your center, keep your shoulders back and your head up. Try to keep your spine straight and in a neutral position as you do the body-mind balance exercises. Go inward, when you do your body-mind balance exercises. 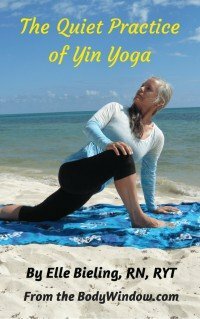 If you are doing poses for strength, flexibility and balance, always find your center, the core of your being. If you are doing cardio on it, make it rhythmic and meditative. The balance trainer will force you to find your center while jumping and improving your body balance and coordination. Everyone can focus and train on their balance. Whether you are a middle-aged klutz or a young, highly skilled athlete, the Bosu Balance Trainer has something for you. Just like Yoga, the Bosu ball is another tool for opening the body for it’s messages, finding your body-mind balance, finding your Power, in the core of your being. So, let’s begin our body-mind balance exercises on the Bosu Balance Trainer. State the following, "Today I find my Power and I am balanced in my body, mind and soul!" May you use your Body Window today to find health and healing of your body-mind-soul with these balance training exercises.